Regu posted an interesting question recently: “Is scalability a factor of the number of machines/CPUs?”. His answer can ultimately be summed up as “yes, but…” – it was qualified in terms of threads: “… scalability in a well designed system is a factor of number of threads that can be efficiently executed in parallel”. The word “efficiently” meaning that the threads are actually doing work and not just waiting. However, the question of how many machines do we need is a hard one. Nick calls out a very important point on this, “An asymmetric farm, with machines of varying capabilities, is really hard to tune.” In all cases we find that load-leveling mechanisms like queues are good for scalability. 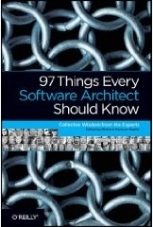 If you use the Pipeline architectural pattern (page 5) that is so well known in the embedded/real-time space at the macro level (inside the service, not between services – that’s SOA), and SEDA (Staged Event-Driven Architecture) at the micro level you can create an environment where you can know the amount of resources you need to buy/provision for the expected load at a high degree of accuracy. An additional, maybe even more important benefit has to do with the resiliency of such a system. If there is a degradation in resource performance or availability, the system won’t come crashing down but rather “limp along”. Conversely, if load continues to increase beyond expected maxima, the performance (in terms of throughput) of such a system would not degrade. By monitoring response time per request, you could notice the upward trend and provision more resources. If you were working with a grid-like infrastructure, you could set these rules up so that they would be executed automatically. These are the building blocks for building “self healing” systems – one of my current favorite areas of interest. Bottom line, I’ve found that the layered-architecture/tiered-distribution pair to be rather limited in terms of scalability (in terms of load). I would say that the solution isn’t necessarily to move to a Space-Based Architecture, as Guy mentions in this post, although many of the event-based concepts are definitely broadly applicable. Werners Vogels (Amazon’s CTO) mentions the CAP (consistency, availability, partitioning – choose 2) model for distributed systems in this podcast which I think is critical in analyzing the different parts of a complex system. On the flip side, Patrick does an excellent job of warning about the dangers of other appealing, siren-esque paths – follow them at your peril. I’m afraid that there aren’t any easy answers, but at least we have some models that have proven themselves viable in the most strenuous scenarios. These models sometimes contradict popular architectural styles and it’s good to be aware of that. At the end of the day, it is our job to make the difficult technical tradeoffs. Check out the “Ask Udi” podcast for this topic: Space-Based Architectures for the Web. Most IT systems should create value by providing business logic that operates on business data. Since most current architectures are client/server or tier based, if you measure the value generating code vs. mandatory tier communication/serialization/data mapping you’ll find an avg. of 70% for non-value code and 30% (hopefully) for code that actually creates business value. Why is that? The problem is in the middleware! My suggestion is to change the perspective and look at the application as a whole. In a scale-up scenarios look at each processing unit (partition of the application) as a complete application that can do all business value and not partition by technical value, you’ll get to a complete new paradigm. The first step is to partition by data elements and not by technical elements. This is the essence of SBA. You can easily do this with GigaSpaces, but others like Ebay and Google do this by themselves.